The Washington Capitals rallied from a three-goal deficit to force overtime, but once there they were overwhelmed and Nick Bonino scored 6:32 into the extra session to promote the Pittsburgh Penguins to the Eastern Conference Finals against the Tampa Bay Lightning, sending the President’s Trophy winning Caps packing, once again. It was, perhaps, the most Caps-like way of being eliminated from a playoff series. Logically, it shouldn’t have gotten to overtime. 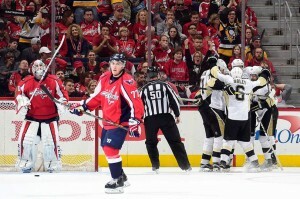 The Penguins came out focused and flying, dominating the Caps in all facets of the game though the first 38 minutes. Phil Kessel put the Pens up 1-0 in the first, then Brooks Orpik was assessed a double-minor high-sticking penalty, and Kessel and Carl Hagelin made it 3-0, cashing in on both penalties, midway though the second period. But T.J. Oshie got the Caps on the board with a power play goal with 1:30 left in the second, giving the Caps some hope going into the third. Then Justin Williams added one 7:23 into the third period and suddenly a comeback looked do-able. Then things got weird, as the Penguins were assessed three consecutive delay-of-game penalties, giving the Caps a pair of five-on-three power plays. They made good on just one, however, with John Carlson’s rocket tying the game at three with 13:01 left in regulation. 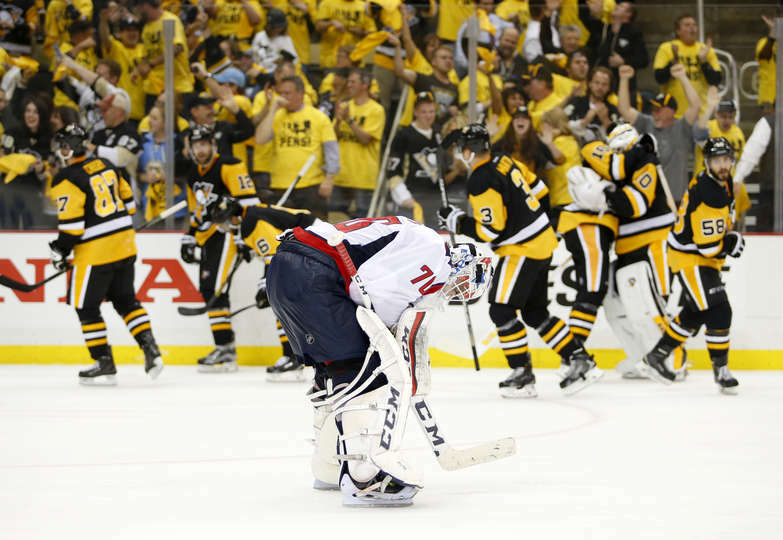 Both teams had good opportunities down the stretch, but as they had all series, Braden Holtby and Matt Murray stood tall and kept things deadlocked to force an extra session. Unfortunately for the road team, the Penguins came out on fire once again in overtime. A sequence early should have ended it there, but Holtby made several “how did he do that” saves, and Jay Beagle dove to deflect a puck off the goal line, only to prolong the agony. Bonino’s game winner came off another excellent save by Holtby, a low kick save, but Matt Niskanen was unable to tie up the Pens’ forward and Bonino got just enough of the rebound on the backhand to sneak it past the prone Holtby and into the gaping net. There are no clever words to describe the disappointment for this Caps team being eliminated in the second round, prolonging the District’s bizarre tenure of being the only city with at least three of the four major sports not advancing a team into a conference finals since the last time the Caps did it in 1998. This team seemed to be “built the right way.” It rolled four lines all season long, and had legitimate NHL forwards in the press box most nights. Could they use another defenseman? Sure, but who can’t? As they’re constructed, the Caps have a nice blend of youth and experience and should challenge the top of the conference again next season. That doesn’t help now, though. For now, it’s disappointment, yet again. 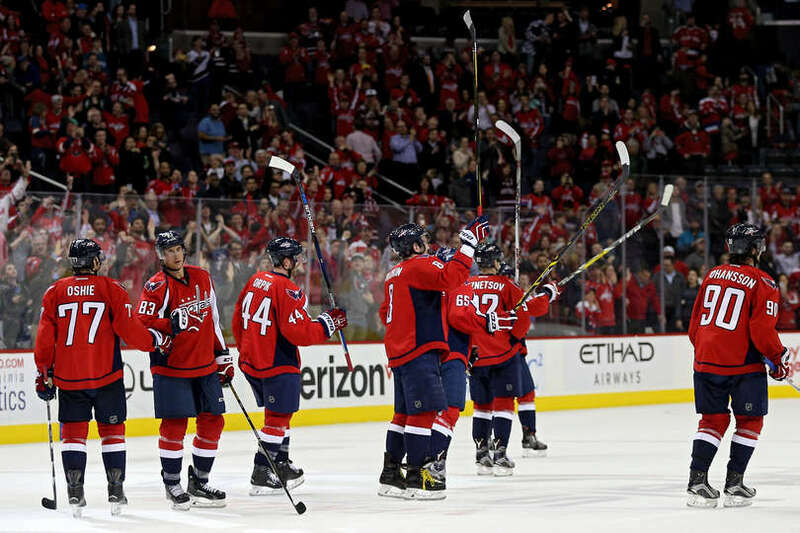 For much of the second half of the regular season, the Washington Capitals got into a habit of playing 20-25 minutes with enough energy to pull out a favorable result. 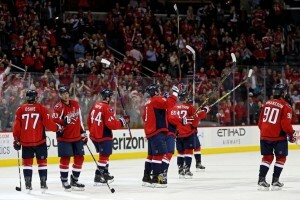 On Saturday night at a raucous Verizon Center, it wasn’t nearly enough. 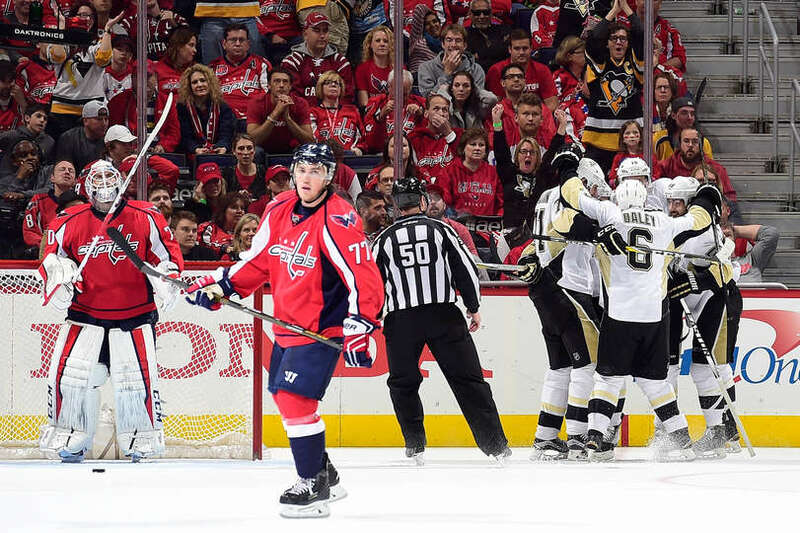 With dozens of hats sailing to the Verizon Center playing surface and Chuck Brown’s “Bustin’ Loose” playing over the public address system, the ultimate outcome of the opening game in the Eastern Conference semifinals between the Washington Capitals and Pittsburgh Penguins lay still in doubt. Fans begged for T.J. Oshie’s hat-trick goal, the game-winning wraparound 9:33 into the overtime session, to stand as called on the ice. The building’s pressure-cooker status reached its peak as referee Dan O’Rourke took off his headset after a review that seemingly lasted as long as this all-time playoff contest itself. His affirmation of the goal resulted in a raucous scene of euphoria. What more often than not felt like the first round of a heavyweight title bout brought a 4-3 decision in favor of the hosts, the latest step in the to-be-determined journey of this team that, at least for now, wears the hopes of its city on its back. With a high-tension game that ended with a five-minute major against the Philadephia Flyers, two ten-minute game misconducts, and a delay-of-game penalty assessed to the Flyers’ fans, the Washington Capitals silenced the Wells Fargo Center and took game three of the series 6-1. The Capitals scored five power-play goals, the most in their history in a Stanley Cup Playoff game. They were 5 for 9 and are 8 for 17 with the man-advantage in the series. The goal scoring in the first, when Marcus Johansson added anther point to his stellar first-round sheet. On the very first power play, John Carlson took a shot from just inside the blue line and the puck deflected just of Johansson’s shin. Adding his first goal of the series to his five assists, Johansson grabbed his sixth point in the series to trail only Nicklas Backstrom and Carlson (7 apiece). 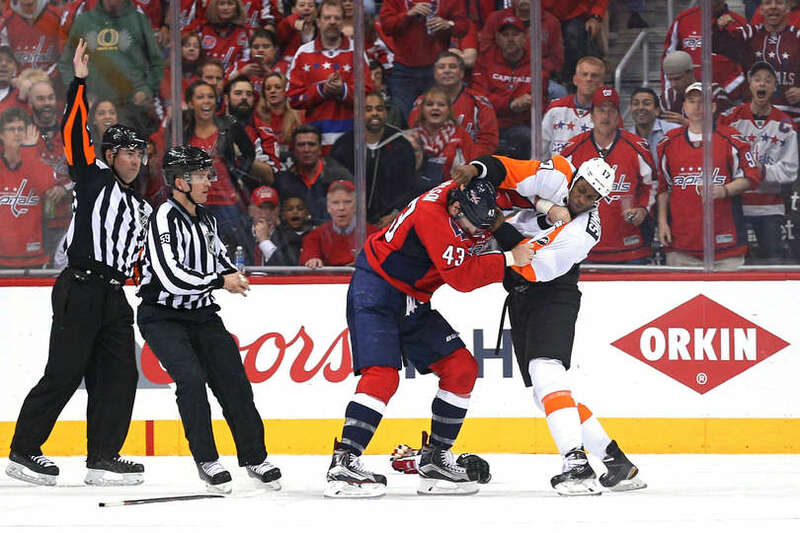 After a physical Game 1, the Washington Capitals came in to Game 2 expecting nothing less from the Philadelphia Flyers, except maybe that they would ratchet the hitting, antagonizing and overall agitating up even another notch. That was certainly the case — and then some — as the Flyers controlled play in just about every facet…except the scoreboard. 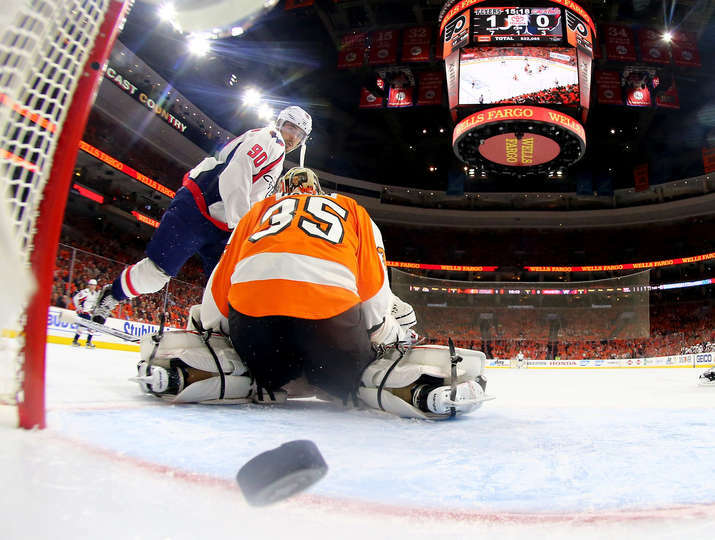 Braden Holtby was again exceptional, especially in a first period where the Flyers got 18 shots, and the Caps were the beneficiaries of one of the strangest goals you’ll ever see, and the Caps beat the Flyers 4-1 before a raucous Saturday night crowd at Verizon Center to take a 2-0 lead in the best-of-seven series. The Flyers came out, well, flying, at the start of Game 2, outshooting the Caps 7-1 in the first few minutes. It was Washington that got the first power-play opportunity, and they made good on it. The Flyers tried to clear with a lob, but John Carlson caught it open-gloved to keep it in the zone. Stung, he passed it off twice before trying a shot, and his wrister from center point got through a double-high screen and past Steve Mason to put the Caps up 1-0, despite being outplayed. The Caps managed to avoid the early penalty calls they suffered in Game 1, but it caught up to them late in the first, with Jason Chimera and Carlson both whistled for cross-checks within 50 seconds of each other late. But as he’s been all season long, Holtby (41 saves) was the Caps’ best player, turning aside the Flyers on every opportunity and the first ended with the Caps up by one. Early in the second, Washington made it 2-0 on one of the all-time strangest plays. After a tie-up at center ice, both teams went for a change and Chimera sent a soft backhanded deflection toward the Flyers cage. Mason went down to block it, but it somehow eluded him and went right between his legs and behind him into the net. It needs to be seen to be believed. It stayed that way for about seven minutes before the Flyers got back in it. On an odd-man rush, Brooks Orpik got caught playing a man instead of the puck and it slipped right between his legs to the awaiting stick of Jakob Voracek, who flipped it past Holtby to trim their deficit to one. But just before the second intermission, Mark Streit was whistled for holding, giving the Caps’ vaunted power play another opportunity. Backstrom held at the half-boards, then slipped a pass through T.J. Oshie’s legs – a play they work on in practice — to Alex Ovechkin in his normal spot in the left wing circle. The Great 8 made no mistake, ramming it home to make it 3-1 before the break. The Caps were content to play dump and chase most of the third period, but with just over two minutes left, Nick Backstrom carried in on the right wing and when Mason went down thinking about the pass Backstrom called his own number for the insurance goal and a 4-1 lead. The series moves to Philadelphia for Games 3 and 4 on Monday and Wednesday. 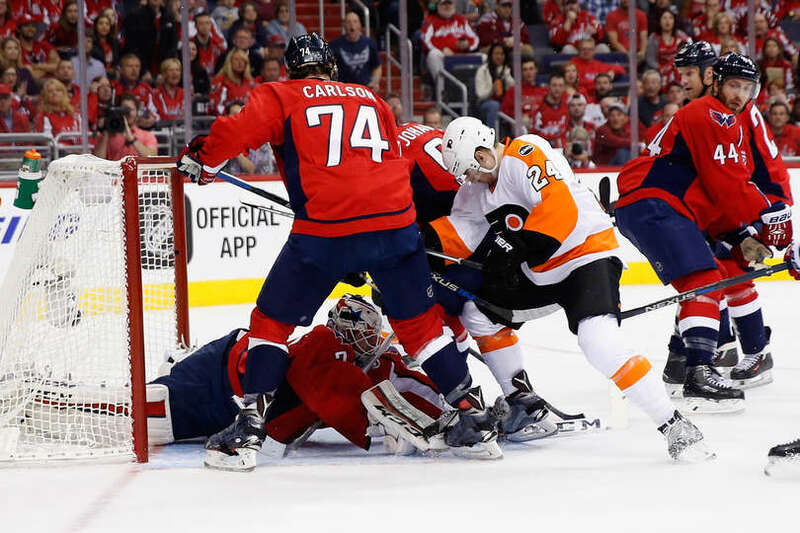 John Carlson and Jay Beagle scored, the team defense was stifling — especially on the penalty kill — and the Washington Capitals took Game 1 of their first round matchup with the Philadelphia Flyers 2-0. The Flyers managed seven shots on their four power play opportunities without scoring. The Caps, meanwhile, were 1 for 6 with their extra-man opportunities. Braden Holtby entered play against the New York Islanders needing one win to tie Martin Brodeur’s all-time record for wins in a season for a goaltender with 48. He was spectacular at times, and was victimized by sloppy defense and a little casualness on his own part, and the Isles came from two goal down to beat the Washington Capitals 4-3 in overtime Tuesday at a disbelieving Verizon Center. The Caps dominated early on, with several very good chances. Then, on an offensive-zone faceoff, Alex Ovechkin took matters into his own hands. He gathered the won faceoff, looped around a defensemen and let a wicked wrister go through a screen into about eight inches of open net past Christopher Gibson — making his second NHL start — for his 46th goal of the season. Alex Ovechkin scored his 46th goal of the season to lead the Washington Capitals over the Colorado Avalanche 4-2 on Friday night. Facing a desperate Avalanche team that needed a win to stay in the playoff hunt, the Capitals (55-16-6) showed that the offense may be back on track — just in time for the playoffs.